One of Asian grocery stores that I frequent is Marina, and they always give out food coupon for your purchase, which can be used in exchange for take out items in the nearby food stall and I usually ends up with either char siew or siew yuk. Most of the times, we eat those as is with steamed white rice, or as the main protein in fried rice, fried noodles, fried rice noodles, etc. Once in a while, when I feel especially crafty, I turn the char siew into char siew bao (pork roast steamed buns). 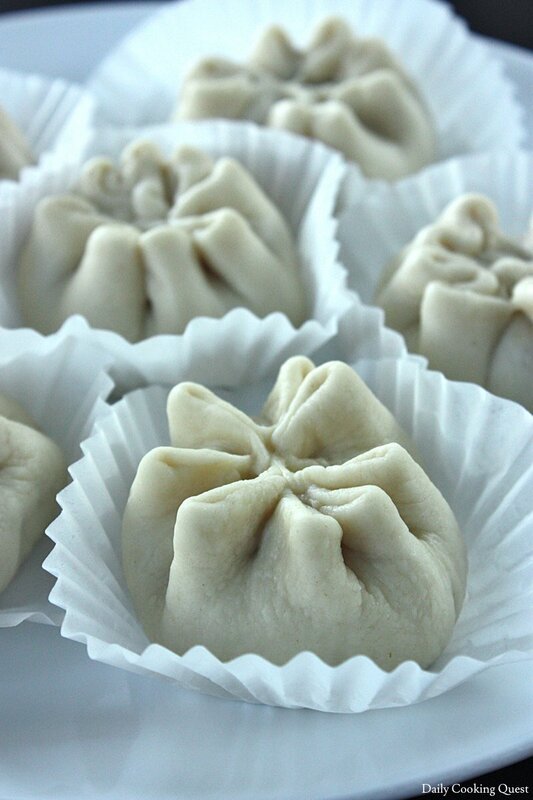 How to Wrap Char Siew Bao: flatten dough to 4" diameter circle, top with 1.5 tablespoon (1 medium ice cream scoop) char siew filling, then gather the edges and make pleats to close the seam. Char siew bao filling can be made with as little as 250 gram of char siew and most of the time I get more than enough to turn my free char siew into char siew bao filling. First, dice char siew into tiny cubes (1⁄8”), then dice 200 gram of onion also into cubes (1⁄8”), cook these with some oyster sauce, soy sauce, sugar, sesame oil, and then add corn starch slurry to create a thick sauce. Done! Easy right? Char Siew Bao - Pork Roast Steamed Buns. How they look prior to steaming. While the filling is chilling in the fridge. Let’s make the skin. 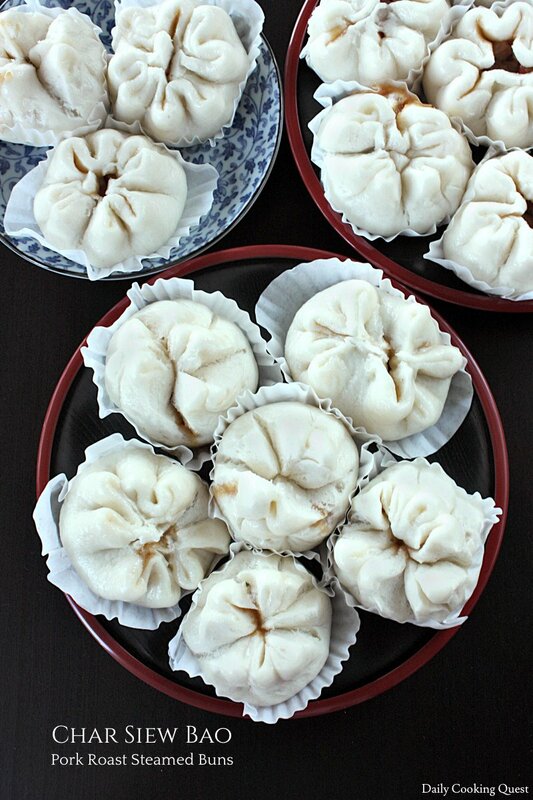 In my experience, there are two kinds of bao skin, the one that is more often sold by mom-and-pop/street hawker variety, and the one sold in dim sum. The skin recipe for the former one usually uses all purpose flour, but the later one usually uses Hong Kong bao flour. Hong Kong bao flour has much lower protein (gluten) content, very similar to cake flour, so the result is so much more fluffier. If you cannot get a hold of bao flour, you can easily substitute with cake flour. The second important ingredient is wheat starch (or tang mien), and I must stress that wheat starch is not wheat flour, please don’t use it. Most Asian grocery stores will carry wheat starch, and if not, you can always get wheat starch online from Amazon. Other than bao flour (which again can be substituted with cake flour) and wheat starch, the rest of the ingredients should be easily available from any decent supermarket. As in any making any kind of bread, I start by mixing some warm water with my active dry yeast and sugar and let the solution sit awhile until foamy (about 15-20 minutes). Then, I sieve together all the flour (bao/cake flour, wheat starch), and sugar into a mixing bowl. Make a well, then pour the foamy yeast solution, along with oil and vinegar. Next is knead, knead, knead, for about 15-20 minutes, until the dough is non-sticky, smooth, soft, and elastic. Cover the mixing bowl (with the dough inside) with a wet kitchen towel/saran wrap, and let it proof until the volume is doubled, about 1 hour in a warm kitchen. Once the dough has finished proofing, mix 10 gram baking powder with 10 gram water, and sprinkle this on the dough, and knead the dough again until the baking powder solution is incorporated into the dough. Divide the dough into 16 portions. Next step, shaping the buns. 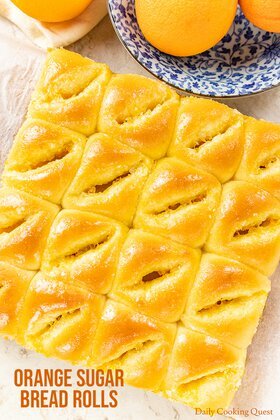 Take a piece of dough, flatten into 4” circle with a rolling pin, place 1 medium ice cream scoop (1.5 tablespoon) of char siew filling on the dough, then gather the edges and make pleats (like this). And if it is too much to make pleats, you cannot go wrong with simple round buns :) I use medium size ice cream scoop to portion my filling, and it is the perfect amount for 16 buns. Once they are done, simply steam for 12 minutes, then rest for 2 minutes in the hot steamer, then open the steamer and remove from steamer. Enjoy! 250 gram char siew, diced into 1/8"
200 gram onion, diced into 1/8"
Heat oil in a frying pan on medium high, and sauté onion until translucent. Add char siew, sugar, oyster sauce, soy sauce, and sesame oil. Cook for 1 minute. Pour corn starch slurry and keep stirring until the sauce thickens. Transfer to a mixing bowl and let the filling rest in the fridge while we prepare the bao skin. Mix together warm water with active dry yeast and 10 gram sugar, and let it rest until foamy, about 15-20 minutes. Sieve together Hong Kong bao flour (or cake flour), wheat starch, and sugar into a mixing bowl. Make a well in the flour, then add foamy yeast solution, oil, and vinegar. Knead until the dough is non sticky, soft, smooth, and elastic. Hand kneading is about 15 minutes. Place the dough in a mixing bowl, cover with a wet kitchen towel/saran wrap, and let it proof until volume is doubled. About 1 hour in a warm kitchen. Mix together 10 gram baking powder and 10 gram water. Sprinkle this on top of the dough, and knead the dough again until the baking powder solution is fully incorporated into the dough. Divide the dough in 16 portions. Take a piece of dough, flatten into a 4" circle. 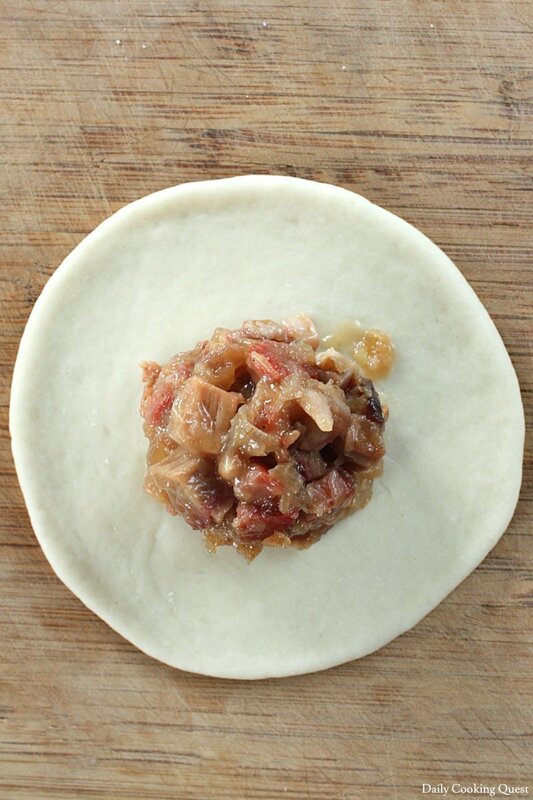 Place one medium ice cream scoop of char siew filling (1 1/2 tablespoon) on the center of the dough. Gather the edges and make pleats to seal the filling inside the dough. Place on a cupcake liner. Repeat for the other 15 portions. Prepare a steamer on medium-high. 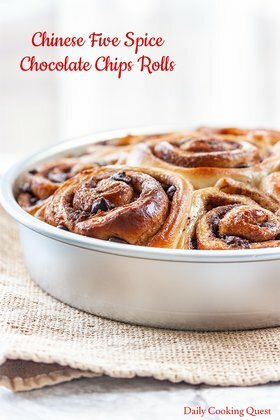 Steam the buns for 12 minutes, then turn the heat off, and let the buns rest inside the hot steamer for another 2 minutes. 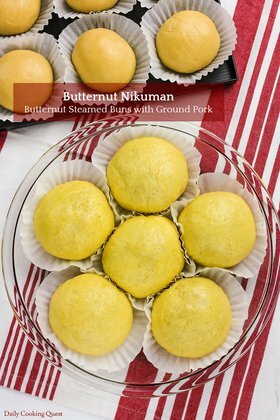 Remove the steamer lid, take the buns out, and serve the buns hot. 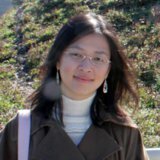 Hi Anita, I love your blog site!!! Thank you for all the recipes :) Can I ask what kind of vinegar should be used in this recipe and what is it for anyway? 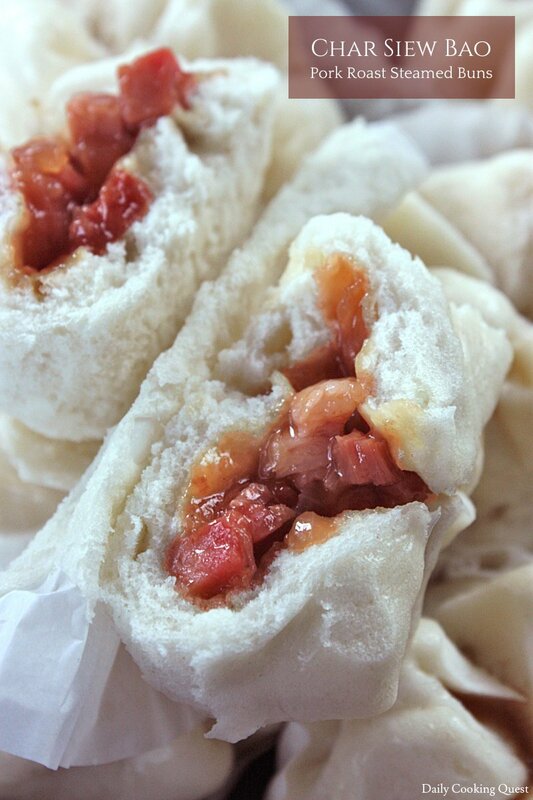 Also, I assume I can use the same bao skin recipe to make chocolate filled one?